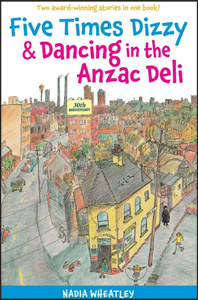 Together Five Times Dizzy and Dancing in the Anzac Deli tell the tale of Mareka and the Wilson kids, who live in an ordinary inner-city neighborhood but find themselves caught up in a haunted house and the mysterious Munga, it sometimes seems as if Smith Street is the most exciting place in Australia. Five Times Dizzy was first published in 1982, and would have been considered a contemporary novel at that time: drawing on the inner-city life of a recently migrated family from Greece. It was possibly one of the first children’s books that dealt with multiculturalism. Today this title can be explored in a historical context, as well as a cultural context, with young readers. "Greek/Australian family story set in inner Sydney. Acknowledged as the first Australian multicultural book for children."